My name is Maria, and I'm a rising 3rd year, studying Political and Social Thought. I'd like start with how I got here at UVa. When I was a senior, my parents told me I could choose between Virginia and a smaller private college. When I picked the other one, they told me to pick again... Virginia's in-state tuition was too good to pass. I thought I'd come here for a year, and then transfer out. I guess I'm a great poster child for the allure of these grounds. We have a 98% retention rate through second year, and 96% retention through all four years- students come here and we stay. So why did I stay? Yes, I got involved (my main activities are Early Vocal Music and ballroom dance), but what kept me here was my professors. We've got a student faculty ratio of 16:1, but that doesn't really give any context for what it's like. The professors here are rock stars. At first I didn't know how to approach my professor. ("How am I supposed to start a conversation with this genius?? I don't know anything!") Three weeks in, I found out about the Take-Your-Professor-Out-to-Lunch program, where the College (of Arts and Sciences) will give you the University debit card to do exactly that: eat. Youreserve the card ahead of time at Garrett Hall, and pick it up that day. 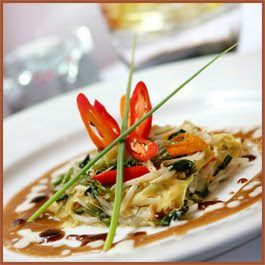 You can go anywhere on a huge list that includes the more popular restaurants on the corner. Awesome. It's a casual way to get to know your professor as a real human being, outside of the context of rigorous scholarship... although I did find myself reviewing my notes everytime I took out one religious studies professor. =) You don't have to be best friends with every professor. In fact, you really don't have time- but you definitely have the opportunity to get to know a few of them one-on-one, whether it's office hours or a scheduled coffee chat. I sometimes get asked, what kinds of things do you bring up with professors? I would recommend googling at least ten minutes on professor that you want to talk to. Find out what they've published recently, what classes they've taught, and where they've studied. Read some of their articles, ask undergraduates (and their grad students, if you can find them!) what they think... when you get to office hours, all you have to do is give them an idea of where you connect with them. In my experience, most professors love to talk about their research, and they like to hear about student initiatives in their research field. On a side note, at UVa we call our professors, "Professor soandso-" I don't think I've ever heard my professors go by "Doctor." This comes from a tradition begun by Thomas Jefferson. Every tour I give, I get the questions, "Will I be able to graduate in four years? What if I can't get all of my classes each semester? How many people have to spend an extra semester or even a year to finish and graduate with a degree?" Having never had a problem at UVa, I decided to do some research. There are so many fear mongering articles out there warning students to watch out or they won't graduate until they're 33, to be careful in choosing a college, to be wary of large universities because they drown individuals in a sea of faces and don't care what the result is. I don't know where these writers were going, but it wasn't UVa. Let's get these facts straight. Incoming first years pick their classes over the summer during Orientation. The Spring semester before that summer, current students pick their classes, but in most classes, seats are saved in anticipation for the first years signing up in the summer. At Orientation, first years have access to an advisor as well as two students who can help students plan for meals, walking distances between classes, and homework load. During the first few weeks of August, students gain the ability to change classes. Movement definitely happens, and if you didn't get everything that you wanted, early August is your first shot to move around and try for it. The first two weeks of Fall and Spring semester are called "Add/ Drop." During this time, students can visit 15 classes if they'd like, and they can change which 5 classes they want to keep for the semester as many times as they want during that time frame. There is no penalty for dropping a class during this time period. I repeat: zero penalty. No one knows how many classes you added or dropped during that time. It's completely okay, and tons of students shuffle and resettle with new schedules. If after class sign ups, August, and Add/ Drop, you still do not have the exact schedule you want, you can try Course Action-ing into a class. It's a simple form that you print out and bring to the professor of the class you're not in, ask them to sign it, and you're in. It's that simple. Especially in the larger lecture halls that have over 100, adding even 10 more students won't affect the professor at all. Everything said, as a coming in as a first year, I got every class I wanted. This Spring, I signed up for my 2009 classes but didn't get Italian 201. I went to the professor of the class, and she said not to worry and that I could course action into her class in the Fall without any worries. And so, I say now what I always tell prospective students searching for colleges: you can either make this a really fun and exciting time to explore your options as a future college student, or you can make it a death march and burn out before July. Relax; it all works out. 1. What do you do at UVa? Well I do alot of stuff...wake up, take a shower, eat...alot, go to class, and sleep. But what I'm passionate about here on Grounds are my various activities that I've gotten myself into. I am big believer in service and service-learning so I volunteer at the local daycare and hospital as well as little service projects for various different CIO's (UVa lingo for clubs). Another major activity is my involvement with the Office of Admissions in helping to pitch the University to prospective students and this is done through online chats, Days on the Lawn, and even giving tours this summer. 2. What have you done in Charlottesville? I've been to the John Paul Jones arena for a monster truck show and Jay-Z and T.I. concert. I've been to the local ice-rink downtown to skate for the first time with fellow summer Resident Advisers. I've eaten gelato on the Downtown Mall with fellow tour guides. I've volunteered at the Virginia Children's Museum as a site leader for Project SERVE. 3. I see your name is Pratik so what's up with Tik? I dunno, you tell me. Haha, but really, back in 9th grade when you really don't pay attention in school, my friends got bored and decided to come up with a nickname for me. Thus Tik was born so that is what most people address me by but then again, I have friends who decide Tik isn't enough and come up with a variety of different salutations: Tiki Tik, Tikster, Tik-a-llama, and my favorite, Tik-a-rama-baby's-mama's-drama. I love my friends. If you google "most important questions on college visits" a strongly recurring theme is free time. What on earth are you going to do with your time when you're not reading, writing, and crunching numbers? Depending on the answers, a prospective student can get an idea of how lively the area surrounding the school is, how active the student body is, and if current students are happy because, after all, happy matters. In general, you want to avoid doing anything that requires a warning like this one. But on a bit more a serious note (though, really, I'm not joking when I say to avoid areas with those signs), I'd like to highlight some awesome opportunities for fun on and off Grounds. Well you don't have to go far to find something to do; you don't even have to leave Grounds. All students at UVa are guaranteed free admission to all sporting events (though I should mention that Men's Basketball can be a little different. They have their own system that kicks in when tickets need to go on lottery; however, this process usually results in students going to a game, but perhaps it's just not the exact game they wanted. Also, due to the fact that our Men's Basketball is in their rebuilding decade, tickets haven't been hard to come by lately). Our John Paul Jones Arena was voted the Best New Major Concert Venue in February 2007 and is a great place to go see U2, Elton John, Dave Matthews Band, or any of the other great performance groups that come to Charlottesville. As a student, you do get the first shot at tickets--usually at a reduced rate. We also have 4 drama groups that put on plays every semester, music ensembles (be it jazz, symphony, small ensemble, orchestral, choral, and more). Some of the dorms even have events. Tuttle Lounge has a party every weekend that is a great social event. Why not go down there and play a bit of pool? Maybe you're more into movies. UVa has a movie theater that plays newly released movies for $3 a showing as well as the Robertson Media Center, home to over 16,000 movie titles that students are welcome to rent anytime free of charge (pictured right). Charlottesville has so much to offer as a city: two shopping malls, a shopping center at Barracks, an ice skating rink, two movie theaters, a bustling arts scene, and more restaurants per capita than New York City. Hello to all new blog readers! My name is Peter Simasek, I am a rising third year here at UVA currently studying Spanish and international business in the McIntire School of Commerce. There are a multitude of things that I thoroughly enjoy about UVA and the surrounding Charlottesville community, but one of my favorite things to talk about is the food here around Grounds, on the corner and in the historical downtown mall. Basically any type of cuisine you’re craving, we’ve got it! Although the three buffet-style dining halls around grounds (Newcomb, O-Hill, and Runk) are all great places to grab some grub, being Italian, none of them compare to the Italian food that mia famiglia and I cook at home. As an alternative to the dining halls on Grounds, one of my favorite spots off grounds – but still within walking distance of The University – is C&O Restaurant, located in the historic Downtown Mall. Satisfying growling stomachs since 1976, The C&O Restaurant offers a variety of food. Above all, the best item on the menu is the marinated Cuban Steak. There’s no better way to end the perfect dinner Downtown than treating yourself to dessert at Splendora’s. This is one of the sweetest spots in Charlottesville, and serves daily anywhere between 24 and 36 different flavors of Italian ice cream including stracciatella, hazelnut, and amaretto!! Grabbing a double scoop of gelato reminds me a little bit of home every once in a while. No matter what your appetite is, the Corner (that is within walking distance of the Grounds of the University), as well as the historic Downtown Mall, always are guaranteed to have what you’re looking for! Stay tuned to my next culinary installment. Hey everyone! I’m Leah and I'm a rising second year. Galax, Virginia, a small town in the southwestern part of the state is where I call home. Most of you have probably never heard of it, but I promise it does exist. It's famous for beautiful scenery and outdoor activities. 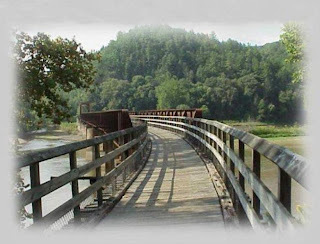 The picture to the right is on the New River Trail, a major biking attraction in southwest Virginia. I have wanted to come to UVA since I was in fourth grade despite my hometown being overwhelmingly obsessed with Virginia Tech. Currently I have no idea what I’m going to major in and spent my first year taking classes in as many different departments as possible. Hopefully something will click soon but in the meantime I’m enjoying exploring a broad range of topics. I hope this blog gives you a better understanding of the undergraduate experience at UVA and makes your application process as smooth as possible! There are so many opportunities to get involved at the University of Virginia. As I mentioned earlier, I decided to spend my summer giving tours of the grounds to prospective students and their families rather than hanging out at home with my friends. Nevertheless, my job through the admissions office here at UVA has proven to be more fun than I could have ever imagined it would be. I absolutely love speaking with students who are on their college-searching tours throughout the nation, as well as their parents – not to mention, I even get a little jealous sometimes because as a prospective student, they’re about to embark on the greatest four years of their lives, especially if they choose to do so here at UVA. I have learned that every day for me here in the admissions office and giving tours, is a new adventure. Regardless of the fact that it may be 90 degrees outside, 90% humidity, it’s always important to know that even though I may be giving my 40th tour of the summer, it’s going to be someone else’s first tour. It’s really important to keep this mind, and by doing so, each tour I give is more fun, more exciting, and more energetic than the last! A lot of students decide to stay on grounds for the summer. Sometimes it’s because they’re taking classes throughout one of our three summer sessions, and other students just opt to stay in town because they’re paying rent, their friends are here, and they just want to have a relaxed time hanging here in Cville. There are so many fun things to do here in town – tubing down the James River, hanging out on the university’s lawn, camping or hiking in the Blue Ridge Mountains, shopping, movies – just to name a few! Regardless of what students end up doing here in town, summer is guaranteed to be a blast! There are lots of fun things to do in and around Charlottesville. One of the fun places to hang out is the Downtown Mall. You can get to it by hopping onto one of the Free Trolleys that runs through grounds. It's a pedestrian shopping area with lots of artsy shops and boutiques and a few arts theaters/galleries. It also has a wide selection of restaurants and coffee shops and has a movie theater. A cool thing about it is that, at one end, it has a 42 foot chalkboard for anyone and everyone to write on. At this same end is the Charlottesville Pavilion which is a concert venue. Some past performers include Jason Mraz, Alanis Morisette, Smashing Pumpkins, Willie Nelson, Modest Mouse, Switchfoot, Lynard Skynard, Bruce Hornsby, BB King ... the list goes on. On Fridays in the summer, they have a FREE concert series called "Fridays After Five" where they invite some lesser-known bands to come perform from 5:30-8:30pm. On a Friday a couple of weeks ago, I went downtown with a couple of friends to experience Fridays After Five. I like to say that I like all kinds of music, but I really just wasn't feeling this blue grass band that was performing this particular Friday. So after sitting and trying to get into the music for a good 15 minutes, my friends and I decided to get some dinner. We decided to go Downtown Thai where we sipped on Thai iced tea and ate pad thai. We followed that up with gelato from Splendora's. It started raining, so we took up shelter under a store awning nearby. Let me just say, the Downtown Mall is people-watching at its best. We sat there for a couple of hours watching schools of high school students, college students, and townies (and dogs where applicable) walk by. Then as we were leaving, we decided to check out the new Urban Outfitters store that just opened a few weeks ago, and we spent a couple hours downstairs looking at the interesting books they keep in stock. The Downtown Mall's the kind of place where you can go to relax whether you have set plans as to what you're going to do or you just feel like getting out for awhile. My three years here at UVA has gone by incredibly fast, but each year has proven to be, without doubt, better than the last. My second year spring semester, I had the awesome opportunity to study abroad in Rome, Italy, I mean what better place to study art history than in the art history capital of the world!? I had the time of my life. There are countless opportunities for when students can decide to study abroad. Either in the fall semester, the spring semester, for a summer semester, or if for whatever reason a student did not want to be away from UVA’s beautiful grounds for that long of a period, a three week J-term study abroad course is often the way to go. The J-term course spans the break between end of fall semester and beginning of spring semester. Regardless of what your major is and/or what college you are enrolled in (College of Arts and Sciences, Architecture School, Engineering School, etc.,) there are programs offered in many countries of the world including Australia, Brazil, Czech Republic, Egypt, France, Germany, India, Ireland, Italy, New Mexico, New Zealand, Russia, Switzerland, Thailand, and the United Kingdom – just to name a few. If you’ve ever had the opportunity to ask as college student in their final year what they regret most about their college experience, chances are they might say that they’re bummed they missed out on the opportunity to study abroad. I strongly encourage you to get out there if you get the chance to and go abroad for a semester. After all, it’s one thing to learn about a completely different culture inside the classroom, and another thing to completely immerse yourself in that same culture through a study abroad experience!! Before I jump into blogging here, I thought that you might appreciate some background information on me. I'm Emily, and I come from a suburb in North Atlanta. I am a rising 3rd year; however, this coming year will be my second year at UVA. That's because I came in as a second-year transfer student from a large, urban university. I am working towards majoring in Biochemistry and minoring in Dance. Now, when I say I'm into dance, I wish I could say that I can whip out dance moves from Beyonce's Single Ladies. My dance background's mainly in Ballet, and I have done a lot of Modern since getting involved with the dance program here. In addition to dancing, I'm involved with Madison House, our overarching student-run community service organization, and through it, I volunteer at the UVA Hospital, walk dogs at the Charlottesville-Albemarle SPCA every week, and volunteer with the local Red Cross chapter. I guess something else to mention is that I am pre-med, and I am involved with the UVA AMSA chapter (American Medical Students Association). Men's Tennis: Was ranked #1 in the country the entire season, won the ACC title, and the doubles team of Dominic Inglot and Michael Shabaz won the NCAA Doubles Championship. This makes 3 NCAA championships in as many years. Baseball: Won its first ever ACC title this year and is headed to the College World Series as of this writing. Men's Swimming and Diving: Won its 10th ACC crown in the past 11 years. Women's Swimming and Diving: Won its second straight ACC crown. Men's Cross Country: Won its 3rd ACC crown in the past 4 years. Men's Lacrosse: Was ranked #1 most of the season and advanced to the Final Four. Set the record for the longest game (7 OT's!) ever this year against Maryland and obviously, we prevailed victorious. Women's Rowing: Won the NCAA South Region championship for the 6th time in 7 years. Men's Track and Field: Tied for the ACC title. When trying to decide what I wanted in a college or university, I started by listing the essentials and then giving schools credit for having beyond that list. I didn't want a glorified office space. I wanted the full package: classrooms, libraries, gyms, and grass. That's right. I wanted greenery, architecture, culture, history. Every school you visit will have a library (ps- UVa has 17), will have dorms and a meal plan. At UVa, there are two very special areas that I'd like to highlight. It's important to remember that while you're in college, you will--on average--spend far more time outside of the four walls of a classroom. And so I urge you whenever you visit a college or university to ask the current students what they do outside of the lecture halls. Is there a place to meet? Are there malls? How about restaurants? Later, I'll address Charlottesville's offerings on eateries, but for now, I want to focus on the Gardens, the Amphitheater, and the Lawn. Behind each of the ten pavilions of the Lawn, there are ten gardens, each filled with unique flowers. They are absolutely breathtakingly beautiful. My favorite is pictured above, Garden 5, home to Noble, the University dog that students are encouraged to come visit. The Gardens are completely public; anyone can enjoy them. Clubs and classes often throw parties in the gardens. If you come for a tour, please, please, don't forget to peak into the gardens. Okay, okay, so technically it's not a true amphitheater, but who cares? At one time, the Amphitheater was just a parking lot but no longer. A capella concerts, rallies, and so much more happens here. Chi Omega even has the Amphitheater as a hole in their charity event Golf Across Grounds. Also, a few days before school starts, hundreds of clubs will pack into the Amphitheater hoping to attract new members in an event called the Student Activities Fair. The Lawn is an incredible area to gather for any reason. It hosts major events like Convocation, Graduation, and The Lighting of the Lawn, but it also plays a vital role in student life day to day. I've yet to walk onto the Lawn and not see a student playing frisbee or baseball or reading a book. Last year, my dorm held two cook outs on the Lawn. Everyone came out, shared a meal, and then played and napped on blankets they'd brought. Charity events frequently set up tables on the Lawn, as do clubs doing fundraisers. Monticello and UVa's Lawn together are a UNESCO World Heritage Site. Together, they are the only university recognized by the UN as a World Heritage Site, and one of eight cultural sites in the United States. To put it in perspective, The Statue of Liberty and Independence Hall are also cultural sites in America. This distinction is a huge honor for the University, signifying that it is culturally and architecturally significant and unforgettable for mankind as a whole. Every area definitely has its own rhythm, a unique feel identifying it as an individual area. These differences spice up the environment, adding to the student culture. Thomas Jefferson thought that the word "campus" had far too stifling a feel and that it conveyed the idea of a community surrounded by ten foot high walls and separate from the rest of the world. Wanting to limit the restrictive feel, Jefferson opted for the word "Grounds" to describe his university. Again, Thomas Jefferson played a role in this tradition. He thought that no one could ever truly be a senior in learning, and so to label a person as such after only four years of school was ridiculous. This tradition is one of my favorites because I see it as a highly enlightened way of viewing education as well as an extremely humble perspective of learning. These events are the only two times the entire class will be seated together. At Convocation, the President formally welcomes the entering class to the University, the Honor Code is signed, and perhaps a surprise or two might arise from mysterious places. The students sit facing the Rotunda, the heart of the University and Jefferson's original library. During Graduation, students process down the Lawn to Old Cabell Hall and sit facing away from the Rotunda. Both of these events are highly symbolic: the former represents the beginning of the quest for knowledge, while the latter involves the students walking out into the wider world with the skills they've acquired.